Located in Bramp Close Portsmith, the brewery is easy to find. Head down Aumuller St towards Trinity Inlet. Bramp Close is first left after the railway line. Or just look for the blue warehouse and the U-Brew It sign along the Southern Access Road. 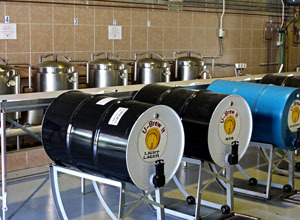 Our world-class brewing equipment will blow you away when you walk through the door. It’s an impressive set up with 6 stainless brewing kettles, 2 bottling taps, canning machine, two temperature controlled cool rooms, filtration and carbonating systems. There are two bar tables so you can chill out while you brew, a big TV to watch all your favourite sporting events, and always great music to keep you going. You can have your own personally brewed beer on tap, and even put on another brew during your function to get your guests involved. They’ll have a ball! 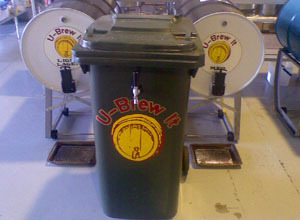 Or take the party with you – our ‘Beer in a Bin’ and Kegarator Keg Hire systems are available for weddings, parties, or any function, with your choice of beer. If you own a restaurant or bar, talk to us about putting our beer on tap, or in bottles with your own label design! Gift Vouchers available anytime and especially for Christmas with 10% off! 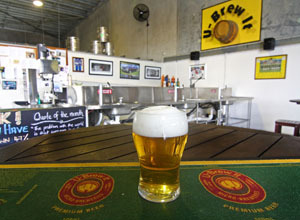 You’ll love the atmosphere and the quality of the beer at U-Brew It. Why go anywhere else? 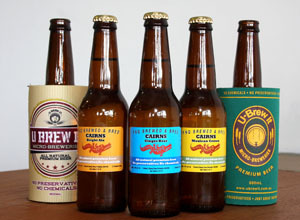 JOIN THE BEER REVOLUTION AT U-BREW IT CAIRNS!